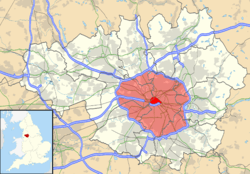 A map of Greater Manchester highlighting the two cordons in red. The M60 Manchester orbital motorway was proposed as the "greater" cordon, and the Manchester Inner Ring Road would have been the additional "inner" cordon. The area covered by the charge would have covered about 80 square miles (210 km2). The original zone covered by the London Congestion Charge was about eight square miles, Singapore two square miles and Stockholm 18 square miles, but the scheme differed from London in that charges would have been lower and the charging hours much shorter. Inbound charges would have applied between 7:00 am and 9:30 am, outbound ones between 4:00 pm and 6:30 pm. There was to be no charge during the middle of the day, later in the evening, at the weekend or for journeys against the peak flow: leaving the city in the morning or entering it in the evening. A group of over 160 Manchester-based businesses calling themselves United City fully supported the Transport Innovation Fund (TIF) bid. A group of over 279 businesses, the Greater Manchester Momentum Group, opposed the plans. ↑ "Manchester Congestion Charge". Pro-Motor Ltd. Retrieved 2008-08-03. ↑ Salter, Alan (2007-05-05). "C-charge details revealed". Manchester Evening News. M.E.N. Media Ltd. Retrieved 2007-11-25. ↑ "Manchester makes move towards congestion charge". The Guardian. Guardian News and Media Limited. 2007-07-27. Retrieved 2007-11-25. ↑ "Traffic Congestion charging: FAQs". BBC Manchester. Retrieved 2007-11-26. ↑ "C-Charge – it's NO". Manchester Evening News. M.E.N. Media Ltd. 2008-12-12. Retrieved 2008-12-12. ↑ Salter, Alan (2007-05-26). "Charge is key to £3bn transport revolution". Manchester Evening News. M.E.N. Media Ltd. Retrieved 2007-11-25. ↑ Towle, Nick (2006-07-06). "'Congestion charge to pay for Metrolink'". South Manchester Reporter. M.E.N. Media. Retrieved 2007-11-25. ↑ "Consultation Brochure" (PDF). Greater Manchester Future Transport. GM Future Transport Consultation. 2008-06-17. ↑ "Greater Manchester TIF Package Unlocks up to £3bn of Public Transport Investment". ↑ David Ottewell (2008-06-09). "Kelly paves way for c-charge". Manchester Evening News. Retrieved 2008-06-27. ↑ "United City Home Page". United City. 2008-06-17. ↑ "Congestion charge survey – Manchester". Manchester Evening News. M.E.N. Media. 2007-03-20. Retrieved 2007-11-25. ↑ Doherty, Peter (2007-08-23). "US-style mayor bid to halt congestion charge". Bury Times. Newsquest Media Group. Retrieved 2007-11-25. ↑ Doherty, Peter (2007-09-13). "Labour call for referendum over C-charge plans". Archant Media Group. Retrieved 2007-11-25. ↑ Salter, Alan (2007-07-27). "C-charge gets go-ahead". Manchester Evening News. M.E.N. Media. Retrieved 2007-07-27. ↑ "Authority says 'no' to road tolls". BBC News. 2007-07-26. Retrieved 2007-11-25. ↑ "Council opposes congestion charge". BBC News. 2007-07-24. Retrieved 2007-11-25. ↑ Britton, Paul (2007-12-13). "Bury blow for c-charge". Manchester Evening News. M.E.N. Media. Retrieved 2008-01-12. ↑ "Council to vote on road pricing". BBC News. British Broadcasting Corporation. 2008-01-09. Retrieved 2008-01-12. ↑ "Congestion Charge 'a con' says Adlard" (Press release). Manchester Conservatives. Retrieved 2007-11-25. The congestion charge in context with the wider improvements proposed as part of the TIF bid. Clean Air Now (CAN) – coalition of independent campaign groups in favour of the proposed congestion charge. Manchester Against Road Tolls – Leading the fight against the proposed congestion charge. 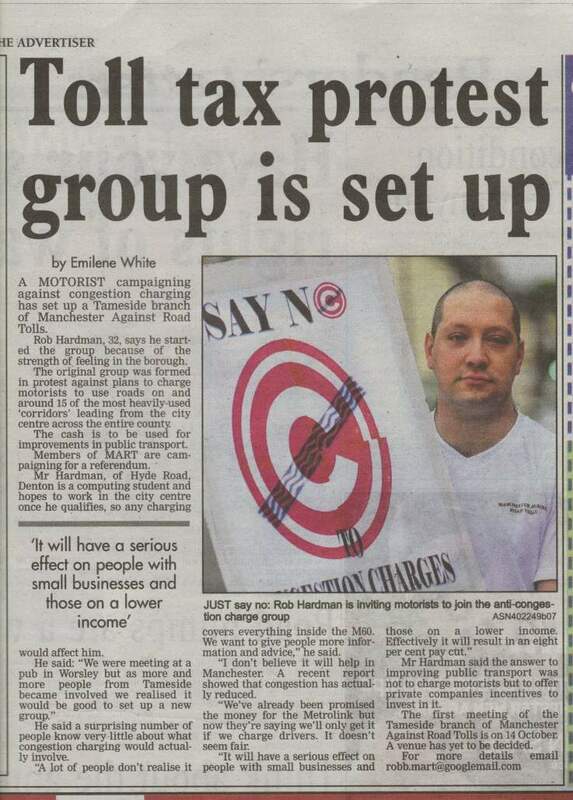 Greater Manchester Momentum Group – Business alliance who is against the current TIF proposal. 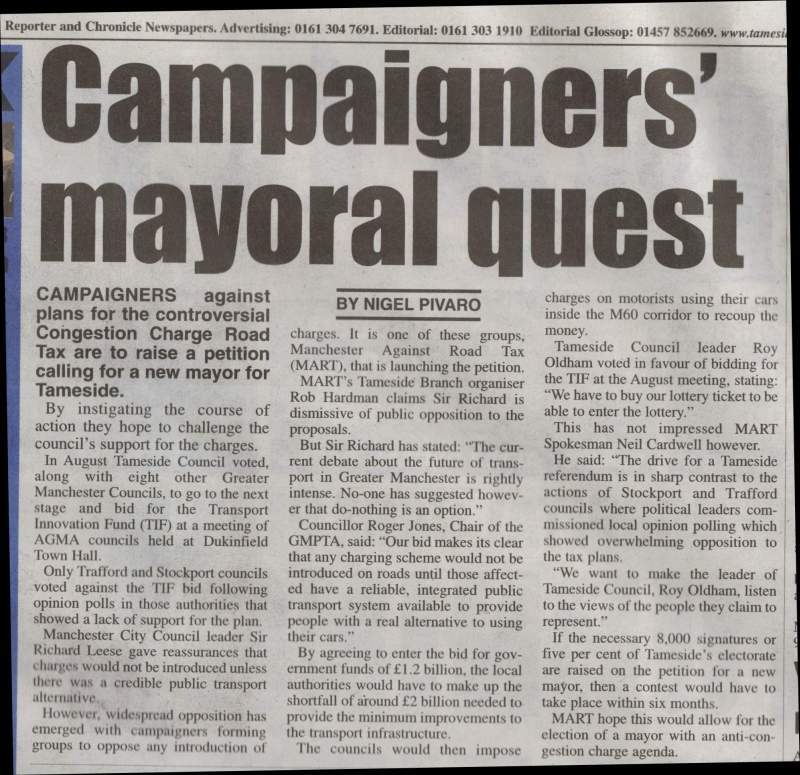 National Alliance Against Tolls – Manchester Information etc., from those campaigning against the plans. United City – A group of major businesses supporting the TIF bid.